The Linnell Family found comfort and care this summer in the West County House. Nine years ago, Megan and Tom Linnell welcomed twin children, Hailey and Brody, into the world. 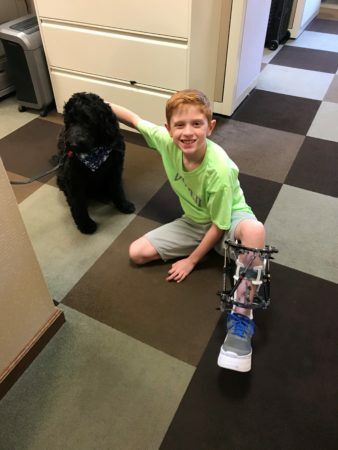 Soon after he was born, doctors discovered that Brody was born with a rare condition called Fibular Hemimelia (FH), causing his left leg to be shorter than his right. At birth, the difference was just 1 cm; however, as he grew, so did the difference in length. At nine years old, Brody’s left leg measured two and half inches shorter than his right. 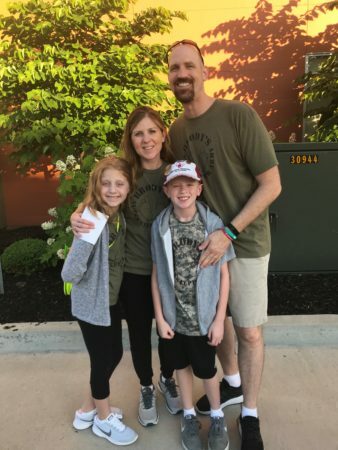 Throughout his life, Brody’s family has made the seven-hour trip from their hometown of Omaha, Nebraska, to St. Louis numerous times to monitor his growth and prepare for treatment. In July 2018, Brody underwent his first leg lengthening surgery at Shriner’s Hospital. During this in-depth operation, doctors placed a plate in his knee, broke his tibia and fibula, placed pins in his knee and ankle and placed an external fixator around the lower part of his leg for support during the realignment process. In the following months, Brody underwent extensive physical therapy as he gained length and strength in his leg. All the while, he and his family found a home-away-from-home at the West County Ronald McDonald House. Megan also credits the supportive environment and lifelong friendships that form inside the Ronald McDonald House. The Linnells returned home to Omaha in August 2018. Brody is happy to be home with friends and family and started fourth grade. He will have appointments once a month until his surgery to have the fixator taken off, afterwards there are a couple surgeries ahead to help correct his knee. The Linnell Family plan to stay again at RMHC St. Louis when they need it. Meanwhile the family wants to start volunteering at the Ronald McDonald House Charities in Omaha.